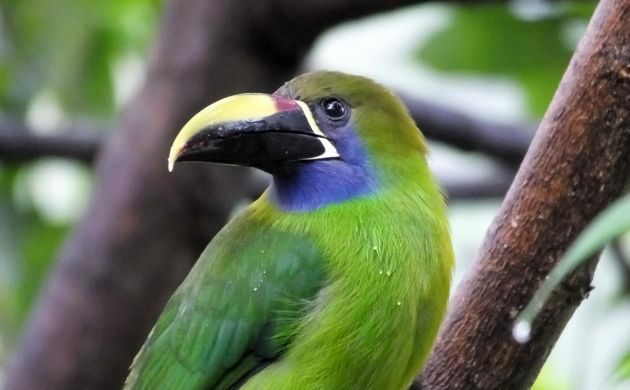 As one might surmise, a “toucanet” is a small toucan. Although still large enough to be a menace to nesting birds, they aren’t as super sized as the “quintessential toucans”, the ones we see on cereal boxes and in advertising. Those would be species like the Keel-billed, White-throated, and Toco Toucans, the latter of which has become such an iconic rep. for its kind that even in Costa Rica, images of the Brazilian species have been used for marketing (much to the chagrin and dismay of local birders). In Costa Rica, most of the six toucan species are fairly common, and one of those is the green, blue, and chestnut Northern Emerald Toucanet. Some call it the Blue-throated Toucanet. 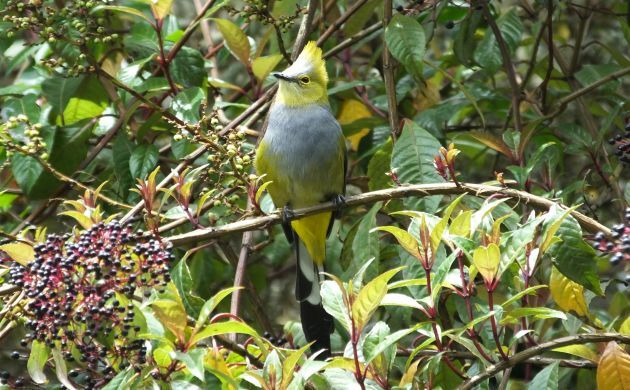 Two types of montane forest=more birds: Around the lodge, a drier type of montane forest occurs that offers a mix of subtropical and high elevation species. 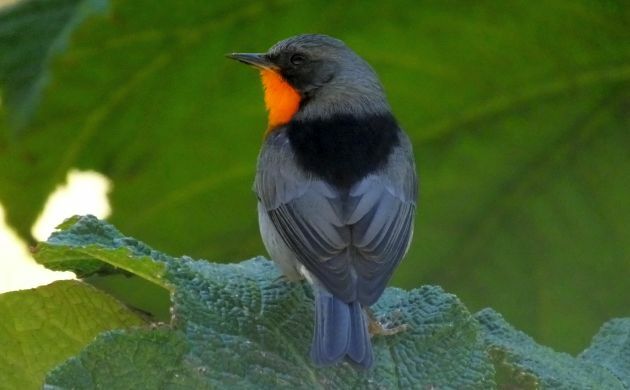 That translates to a fine Neotropical birding mix of common species like Great Kiskadee, Boat-billed Flycatcher, and Rufous-browed Peppershrike along with such regional endemics as the tiny Scintillant Hummingbird, sleek Long-tailed Silky-Fycatcher, and the decidedly uncommon and brooding Dark Pewee. The road that leaves the lodge curves its way up the mountains on the way to the village of Providencia. In doing so, it passes through beautiful, mature high-elevation rainforests replete with giant oaks and wild avocado trees. As one might expect, these beautiful misty woodlands are full of birds that range through the 40 to 60 meter canopy and skulk in the thick, bamboo understory. This is prime habitat for many highland endemics including White-throated Mountain-gem, Yellow-winged Vireo, and Flame-throated Warbler among others. It looks as good as the name indicates. Resplendent Quetzal: Mentioning the star bird first, this glitzy mega trogon is not uncommon near Toucanet. Although they tend to hang out on certain sections of the road, the owners can tell you where, you can walk to the site, and, sooner or later, one or more make an appearance. We had a pair at a nest. 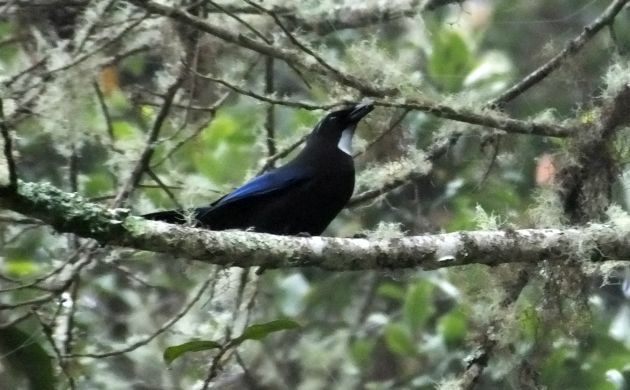 Silvery-throated Jay: Although the R. Quetzal might be the most spectacular bird on the mountain, it’s not the rarest, nor the most challenging to see. One of the more difficult ones is the Silvery-throated Jay. Unlike some of our more familiar Corvids, the picky tastes of this dark jay make it quite the connoisseur. It won’t live in any old stretch of forest, only sizeable tracts of old growth montane oak forest that host critter hors-de-oevres it prefers to eat. 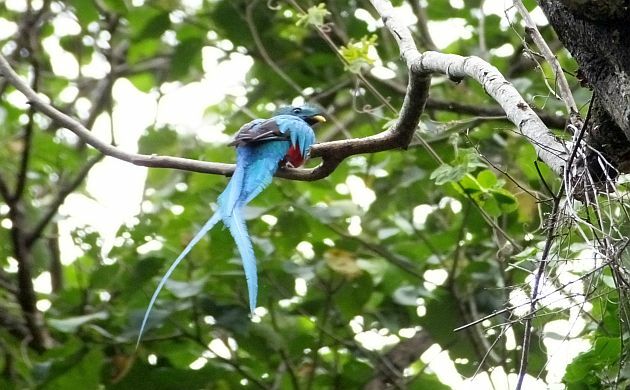 Much to our fortune, I found a few of these prized jays on the road above El Toucanet. A common miss on many a tour! Other highland endemics: As in most of the birds near, and especially, above the lodge. Get onto a mixed flock and most won’ be found anywhere other than the mountains of Costa Rica and western Panama. These are birds like the flashy Collared Redstart, the odd little Ruddy Treerunner, and the hefty Streak-breasted Treehunter (nice name). 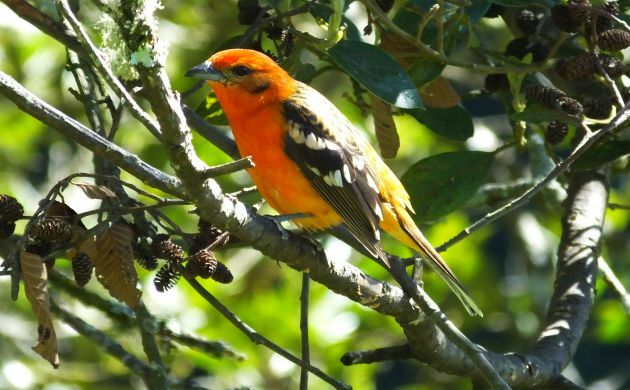 Flame-colored Tanagers! : These are common but always beautiful and easy to see around Toucanet so they get a mention. 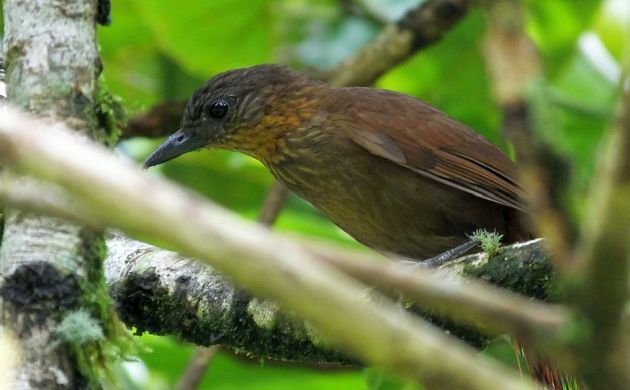 They also have a nice song, sounding a lot like the thrush-like, burry songs of related tanagers. And they come to feeders too! Cool weather: Not a highlight for some, quite the relief for others, especially those who grew up in Canada, Britain, or other places where hats are naturally required. Also a relief after trudging through rainforest and testing the sweat-wicking characteristics of field clothes on the Pacific coast. 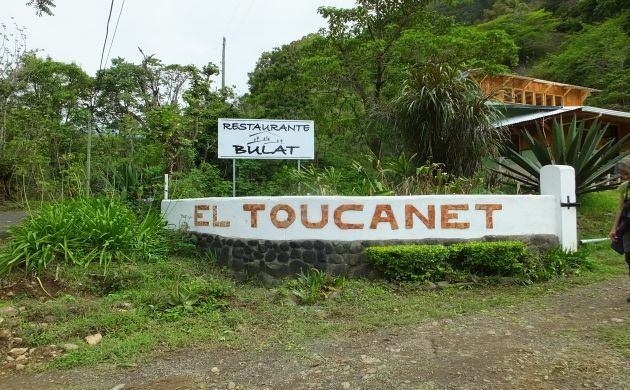 El Toucanet (the lodge): This cozy lodge is a wonderful place for a highland birding escape. The owners are attentive, provide good service, and made us a fantastic rhubarb pie! Guests who don’t feel like walking up the road can enjoy many a bird right from the lodge including Violet Sabrewing and other hummingbirds, and various other fun species, often, all day long. 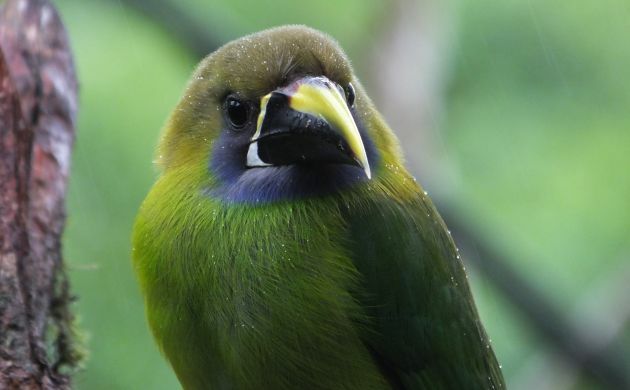 There are several options for fine highland birding in Costa Rica, and Toucanet Lodge is one of them. I have been a few times and as usual, look forward to returning to this peaceful, beautiful, birdy spot. Hope to see you there!